Abhi calls Police and informs about the bank robbery. Surprisingly Manager escapes while everyone is stuck in the bank kept captive by the robbers. He searches for Pragya and sees robber hitting her. Abhi gets much angry on the robber and holds his neck asking him how dare he to hit his Pragya. He beats him and gets much aggressive. Pragya asks him to leave the robber else he will die. Abhi is much angry. Other goons catch them so that they can have a safe exit. Abhi and Pragya foil their robbery plan and get them arrested. Abhi and Pragya’s silent love stares and moments continue. Sherlyn and Prithvi meet in her room. She checks the lock and says it is broken. She checks for her jewelry, but it is not stolen. Sherlyn thinks may be the thief didn’t get the chance to steal because of her mum. Prithvi suspects Karan and Preeta as they were missing from the party. Sherlyn checks and finds her slam book missing. Prithvi gets angry on Sherlyn for being stupid and asks who asked you to note down your secrets. They fear if Karan gets the book then? Sherlyn says it is locked. Prithvi says they are smart and will unlock it. If they read your slam book then we will be exposed. He finds earrings pearl there. Karan tries to open the Slambook, but he couldn’t. He tries to break the lock. 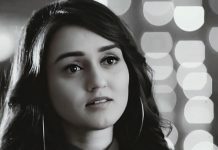 Chachi comes there and tells him that she is sure that Sherlyn is pregnant and shares her doubt that Sherlyn and Prithvi are having an affair. 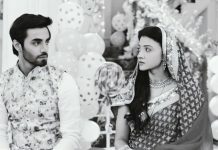 Karan assures her that he will stop the wedding. Chachi suggests him to marry Preeta and asks him to think about her. Karan says she is my friend and realizes his feelings for Preeta. Karan sees Preeta and his picture and gets mesmerized seeing her. Prithvi and Sherlyn get sure that Preeta had stolen her slam book. Sherlyn asks him to go and bring her Slam book. He comes to Preeta’s house late in the night through the window. Janki sees him and gets shocked. Prithvi teases her and tells that he is going to be the father of Sherlyn’s baby. Janki holds his neck angrily. Prithvi then comes to Karan’s house and steals the slam book from under his pillow. Karan is sleeping and murmurs in sleep that Prithvi is a cheater. Preeta comes to the hospital and gets to know about Sherlyn’s pregnancy. She informs Karan about the same. They come to the hospital and see Sherlyn and Prithvi there. Preeta is shocked by Prithvi’s betrayal. Nonsense. Enough is enough stop boring your viewers with these crap episoded.